A very quiet day at Derbyshire's longest preserved railway, even the warmth of the afternoon failed to draw the visitors to Wirksworth. Firstly can I take this opportunity to thank everybody involved with the running of the Multiple Memories event at the weekend. We had a very profitable and enjoyable weekend with the first usage of Shottle loop. 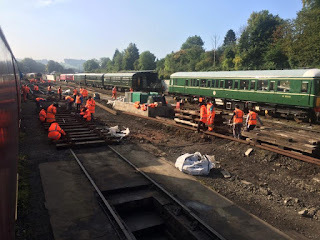 It took many members of staff to put on such an event with members of the DMU team, guards, Booking Clerks, catering teams at both Wirksworth and Duffield for the first time and not forgetting the signalmen at Shottle. It was very late on Thursday that the majority of the work was finished in order to prepare the units for the weekend but there were still jobs for some of the DMU team on Friday. 00:20 on Friday morning a small team went home after struggling to vinyl up 53599 after the repaint - the glue doesn't stick very well at just 4 degrees! The driver experience runs on Friday were enjoyed by all, helped all the more by the sun shining! 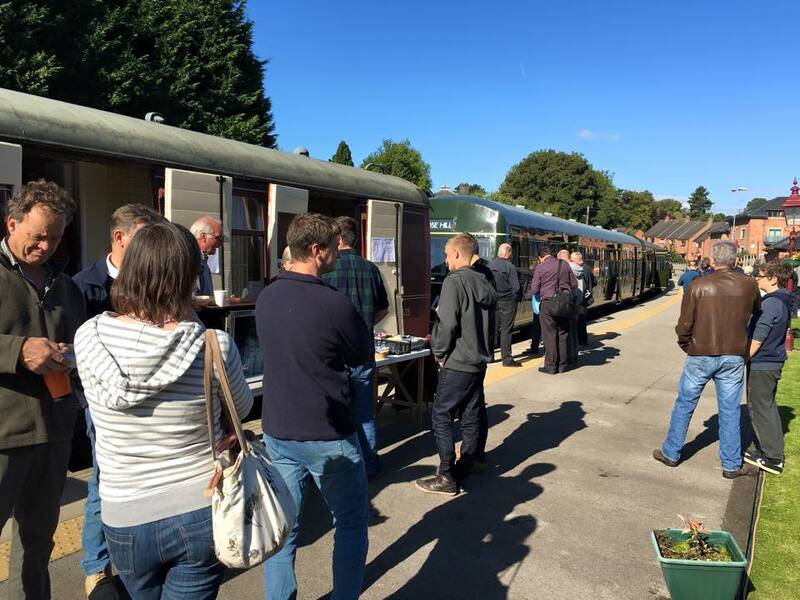 We have had many great comments from members of the Railcar Association, whose attendance helped to make Saturday by far the busiest day of the season. It was fantastic to see busy trains passing each other at Shottle and great to see all of the sets matching in livery for the first time. Sunday was inevitably not quite so busy but was nearly three times as busy as an ordinary Sunday. 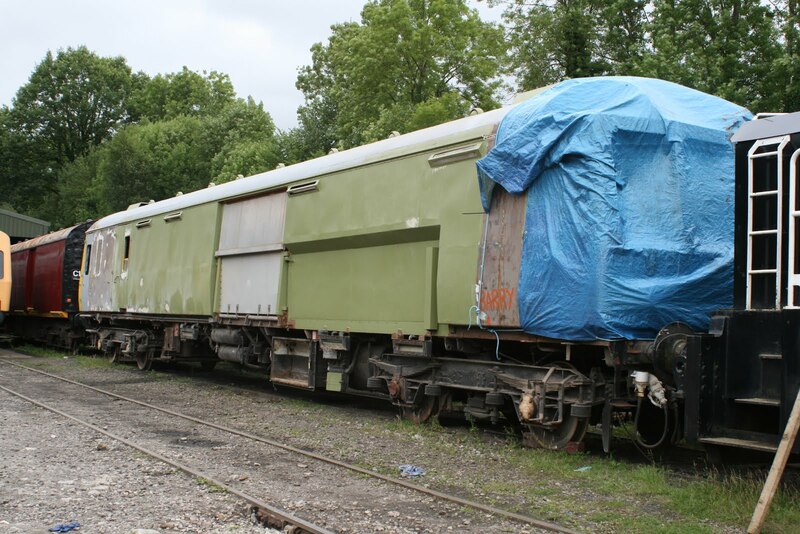 Apparently the Llangollen Railcars sales stand packed up early from being virtually sold out rather than lack of custom! I attach a few shots from a selection of many taken at the weekend. What wonderful weather we are experiencing for late September, lets hope it keeps going for a while yet. Our final Afternoon Cream Tea train ran today, once again fully booked. There was a lot of to-ing and fro-ing from the weighbridge as the DST welded phase two of Kathryn's axle boxes and the remainder serviced the two Barclays. It is good to see Taylor's Siding really beginning to look the part. It is also great to see L J Breeze up and running again after a lot of hard work lead by Doug Futter. PS - a video taken on Monday from the West End dock at Derby Midland Station. A place where I charged out VANCOs, code for van with corpse, usually for the Derby Co-operative Society at 1 shilling (5p) per mile. Also when they were playing at the Gaumont The Crickets went on the footplate of the West End pilot which was an Ivatt Class 2 at the time! Multiple Memories has now become our biggest weekend financial earner. This year we also hosted The Railcar Association Annual General Meeting which brings all the DMU owners and groups from around Great Britain. All the retail outlets and Pullman Buffet all recorded good takings. 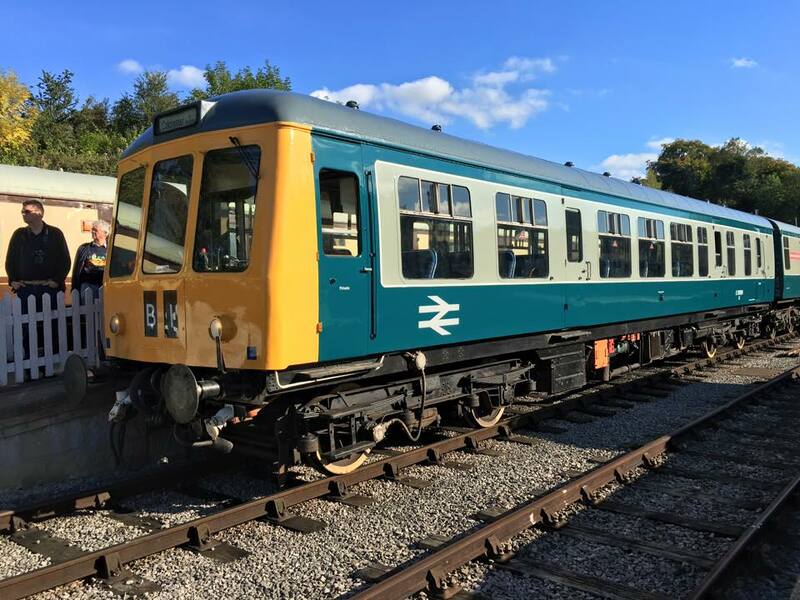 For the DMU group this event is the final result of many months of hard work which as resulted in Met Camm 50253 entering traffic in Green and Class 108 repainted in blue/grey to match the119. A couple of videos from today. Many congratulations to all involved, there were many, for a splendid and quite unique weekend. From the first day of the Multiple Memories Weekend the Shottle Loop is shown in use showing the 1015 and 1105 Wirksworth to Duffield and 1115 Duffield to Wirksworth services where the weekend's timetable was being used and proved by driver experiences. The lot of the Shottle South signalman is obviously stressful! Truly another step forward for our enterprise. Another quiet day in respect of passenger numbers easily handled by Iris. The latest progress on the new Maintenance Facility trackwork to be known as Taylor's Siding as a small acknowledgement of the late Peter Taylor's generous financial support during his lifetime. The other photo is of today's test customer putting a battery powered manrider through its paces before shipment to Hong Kong. The Permanent Way Team with assistance from our ARC apprentices completed the relay of road 3 in the maintenance Facility but not yet ballasted. 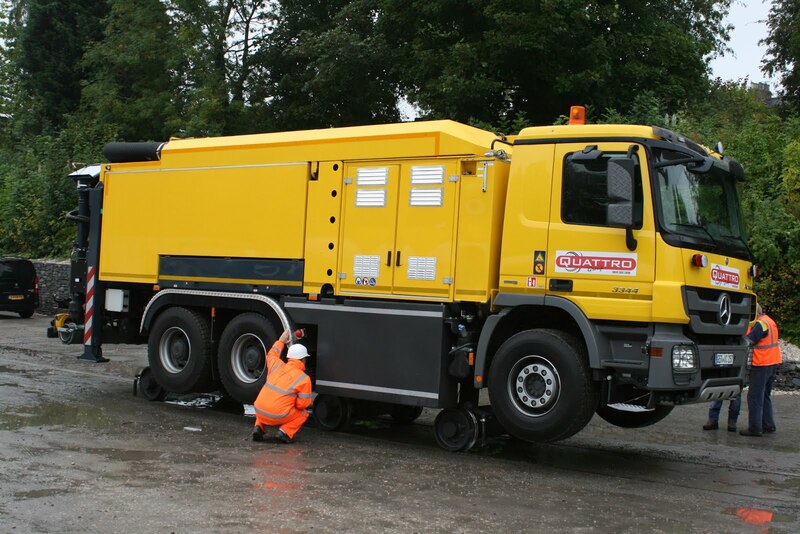 Today's test vehicle was hosted by Eric Boultbee and John Evans ensuring the customer had a successful day with us. It looks as though the Rail-Vac will have some competition. I haven't seen any progress reports for this weekend so I thought I would round up what has been a crazy weekend! The weekend saw good weather on both days which helped us to carry good passenger numbers for the time of year. Saturday featured a coach party and we had a vintage tractor meet on Sunday. Indeed, the first train to Ravenstor, which was being covered by a DMU this weekend, carried 57 passengers which was too many for the 52 seats in Iris! 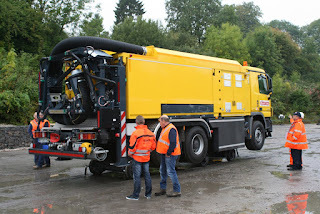 I guess one of the main thrusts of the weekend was the visit of students from Birmingham University and their staff. There were two tasks for the students to carry out, all of whome are studying a masters degree in railway engineering of some description. 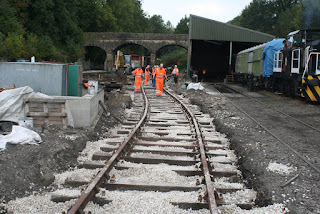 One was to lay the sleepers and rails to connect the new shed road up. Remember, the new road by the side of the shed was laid some time ago by our own PW team and the point was put in just a few weeks ago. The other task for another team was to lay some panels of track into the former grassy bank at the side of the incline which will eventually form a road for steam facilities. Both of these tasks couldn't have even been imagined without the materials generously obtained from Spondon a month or two back. It is also worth mentioning at this point that both the PW team and the Catering Department have worked considerable over time over the last few days to supervise and help out with the track laying and also cater for the needs of the students respectively. Both roads aren't quite complete but they are significantly more complete than they were on Friday - one of them didn't even exist at all! 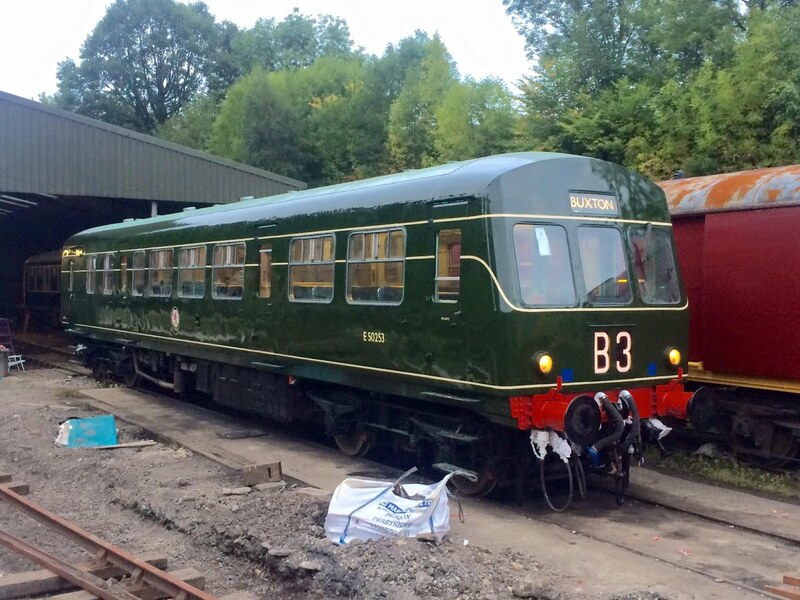 In the shed, the DMU team had all on to continue their preparations for Multiple Memories this coming weekend, which could be one of the biggest operational events we have ever undertaken. 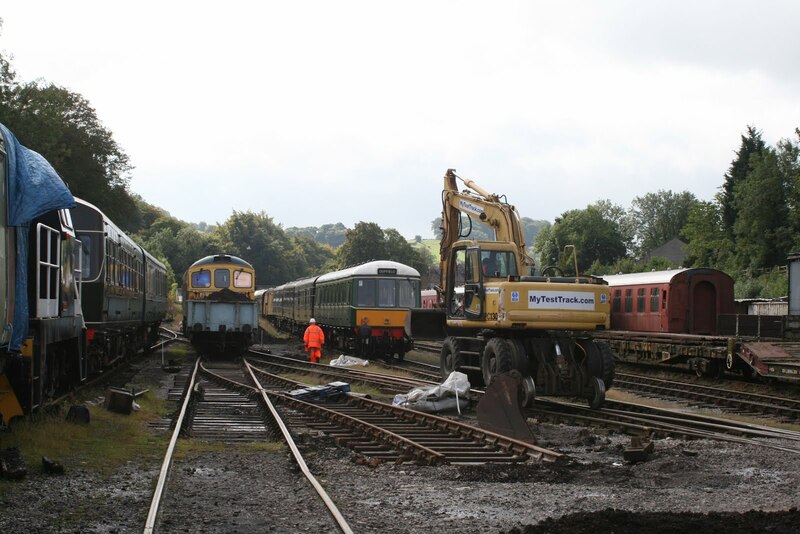 Saturday saw two pack gloss applied to any remaining areas of 50253 which is set to enter traffic at the event and it was lined on Sunday. The decals were also applied. There's still some interior work, such as kick plates and smaller jobs to do this week before Friday's driver experiences although even these areas were progressed on Saturday. 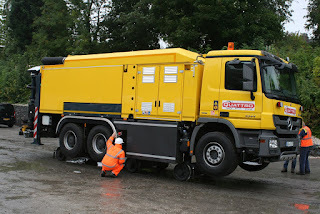 There's still quite a lot of work to do this week to ensure that the weekend runs smoothly and that we can also all enjoy a Buffer Stop Breakfast. There's also some rota positions to fill for the weekend as well! 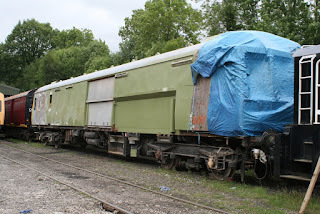 Two photographs - the Birmingham University students having just started work on Saturday and also 50253 sitting outside having just had the lining and decals applied. The light for the latter was fading. It is amazing what unlimited labour can achieve under the guidance of our Permanent Way Team, not forgetting all the preparation in advance! Three cheers to Felix Schmid and the Birmingham University cohort for all their endeavours. There was also a vintage tractor rally at Wirksworth Station which made little impact on revenue but was a great showcase for us to illustrate what we do to often sceptical farmer neighbours. The video shows them off on a traffic stopping tour of the area with a pause at The Malt Shovel for some Pedigree. Lots of activity today with the PW making final preparations for the Birmingham Uni students visitation this weekend. In fact, thanks also to the crew who ran Iris to Duffield to collect them this afternoon. The planned testing was cancelled bit not to worry as it allowed necessary progress on 50253 with items such as grab handles being done. Also the marker lights were wired up this afternoon. Nathan redid the maroon on the ladies/office block which vastly improves this area and new volunteer Andy did a coat of preservative on the quad. Team Tannery fitted some edging and other things in the new Wirksworth Booking Office. A good day. Today's photo is of the quad with the maroon in the background. A common view you may say but one which will be vastly altered when the new Booking Office is nearly ready for opening! Iris handled the service train today. The Wednesday and Thursday service is usually shared by our two single railcars 55006 and Iris but 55006 is suffering from a vacuum ailure and can only work in multiple. The platforms always seemed busy and Richard was seen giving one of his yard tours. Our regular sandblaster appeared early this morning to remove rust from the floor supports of a Rudd to enable Daniel to weld in a new metal floor. we have a large amount of spoil to remove between the incline and road 3 to enable the laying of Maintenance Facility head shunt and new steam shed road, so moving two loaded wagons is quicker and more economical. Single railcar IRIS handled the service today supported by the Pullman Buffet and the EVRA shop. 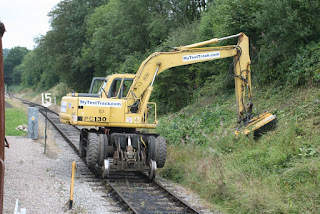 The PWT continued preparing the site for new steam road with several loads of spoil being unloaded up the incline. The last delivery of sleepers and chairs from Celanese at Spondon was delivered and loaded on to a lowmac. John Ball continued in the Operations Office keeping our staff files up to date. The PWT removed remaining spoil from the Maintenance facility where the third siding is to be laid. 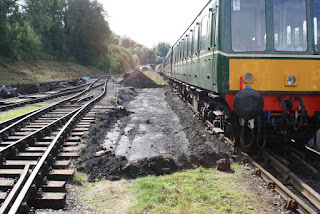 More muck was removed and loaded in the Rudd from new area next to Pullman road for the beginning of steam shed road. This will be laid by Birmingham University Students this weekend. Track and rails were unloaded from the lowmacs and sturgeon for this project. A lot of muck shifting is necessary as part of the creation of a third Maintenance Facility siding and an additional project to create a steam locomotive servicing siding. 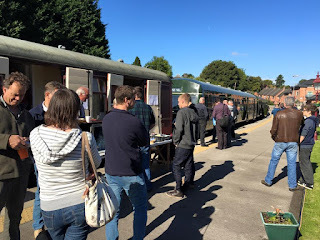 The weather was kind to us today and brought out many visitors to the railway and to view the Festivals exhibitors .who had set up in The Brake van and training room. The 2 car unit again looked after the Duffield service with plenty of passengers using our service from Duffield to visit the festival. 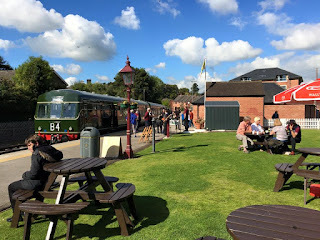 We also had a large coach party from Worcestershire who enjoyed a talk form Eric before their journey in Iris up the incline then enjoyed a walk round the town before catching the 14.15 to Duffield upon their return the whole party enjoyed a shed tour before departing for home. June looked after the car park which was full in no time . Only the Dmu team were on site working down the yard completing more cosmetic work on 50253 and a quick test of the 119 and 101 trailer car up the incline between the Ravenstor service . Many more good comments about how friendly our staff are and how they enjoyed the good food served in our Pullman buffet. My thanks go out to all the staff who again made our visitors day an enjoyable one. 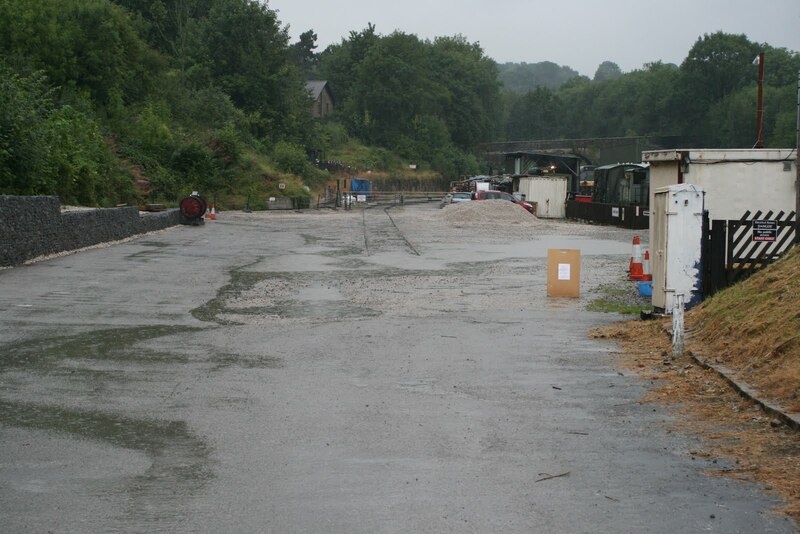 A nice start to the day as the rain held off at first allowing the car park staff to park many cars in our yard before the heavens eventually opened and the bottom car park became a swimming pool. 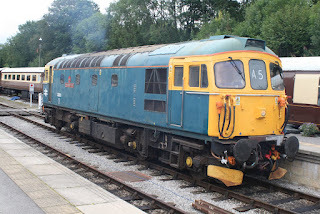 The 2 car unit was used to transport our steady stream of visitors between Wirksworth and Duffield including members of the Grumpy old mens railtour and a couple from the Swanage railway. Iris the Derby light weight took care of the 3 incline services much to the delight of many of the younger visitors. The Model railway and the Pullman buffet were open for our visitors to enjoy with plenty of cakes and bacon butties being consumed. Down the yard the Dmu group carried out an exam on 55006 as well as rubbing down and painting the side of 50253 ready for the Dmu gala in a few weeks. Pity the weather was so poor but the visitors who did arrive said that they thought our staff were a credit to the railway and I thank you all for making it an enjoyable day for them . 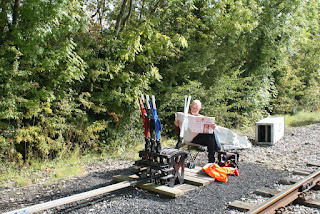 A funny sort of day which was quite sunny saw both Festival artists setting up - one in the Training Rook and one in a Brake Van. The Infrastructure Manager looked after the RAIB who were on a training day and also finished trimming the tiles in the toilets. The Foremen altered the timers and fitted the new flap (pictured) to the desk in the new Booking Office. One of them also got things ready for the Festival. David very kindly came in early and got the new fuel point working. Rodders did some face painting at Duffield in the sunshine. 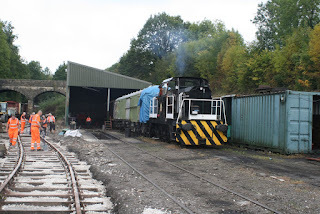 Today's photos are the flap and the brake van. Will staff please note that this weekend is the only weekend we charge for car parking so we need to squeeze as many on the dock over the bridge as possible. dug to feed water into the culvert. continued applying paint to Catherine's sandboxes and running plates. 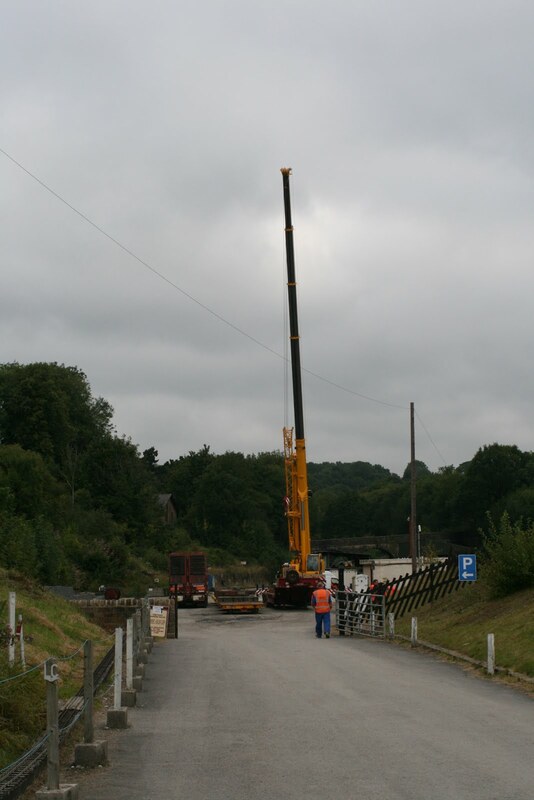 Testing today involved a lot of kit and a very large crane! Mike Billings continued quest to control lineside vegetation concentrated on the Incline today to great effect. Iris looked after our Wirksworth - Duffield service with Chris and Neil looking after our drivers apprentice and his wife who could not thank the railway enough for the way in which they were looked after. 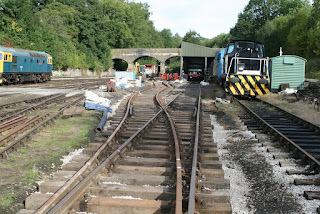 The Narrow gauge , model railway and the ,Evra shop were all open for our visitors o enjoy . The Pullman buffet was kept busy with teas and coffees with some visitors calling in just to enjoy an ice cream or two in the sun . 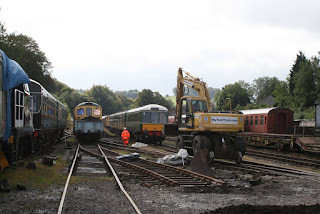 Down the yard it was very quiet with just the Dmu group on site completing further renovation work on 50253 before shunting the shed with 33103 swordfish to place 50253 on the left hand side ready for painting 50253s right hand side . Henry Ellison and the brake van was used on the incline service with many passengers enjoying this new experience. 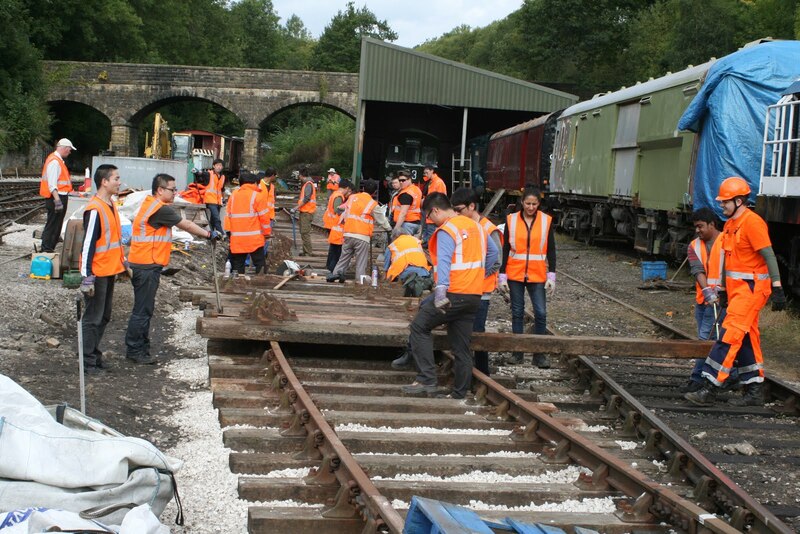 Many thanks to all the staff who worked today and made our passengers visit to the railway a happy and memorable one. Another chilly Derbyshire day which saw us welcome another test customer with a request for the 33. They carried out the tests down the valley and even frequented Town Street Fish Bar, declaring the products as very tasty ahead of their call to use at tomorrow's Tunes and Chips. 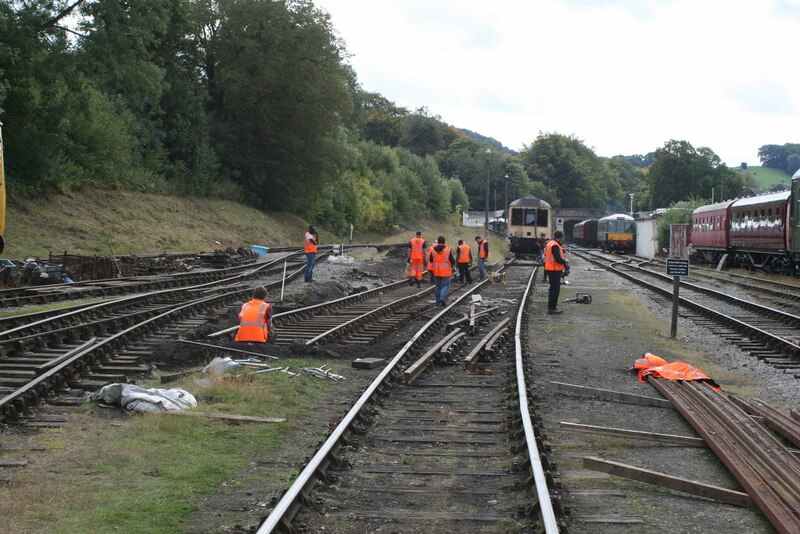 The PW team began digging the bank in the yard ready to lay more track and the 33 assisted with tripping some of the spoil up the incline after it's return from the test. Much maintenance is done on a Friday with Nathan (pictured) painting the refurbished platform trolly and the foremen skirting in the new Booking Office. 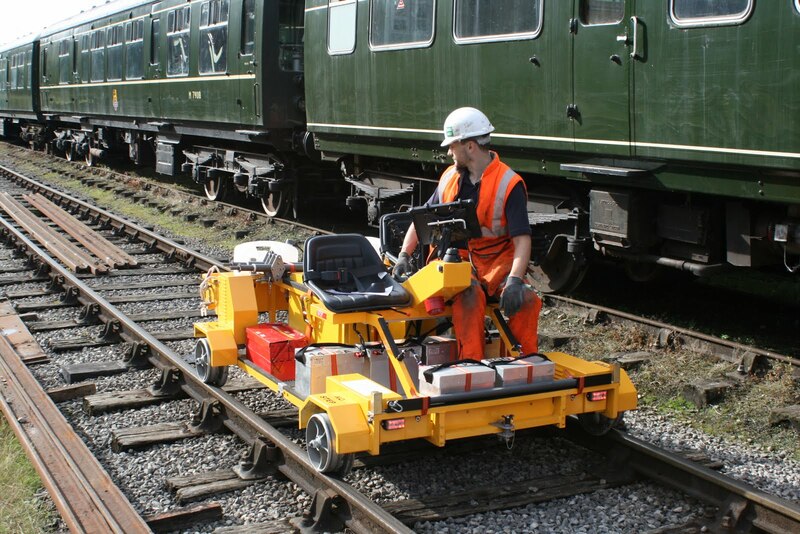 A slightly unusual test request today, which we were happy to meet of course, involved the provision of a locomotive. Swordfish is seen waiting to depart to the test area. Details of Peter Skinner's funeral arrangements have been received. It will be at Markeaton Crematorium Monday 21st September at 1400 hrs followed by refreshments at the Jonty Farmer, Kedleston Road, Derby. home. You can see it flying on Platform 2 waiting room. Is winter here? Chilly in parts today but it didn't stop the passenger service which came back from Duffield well loaded. 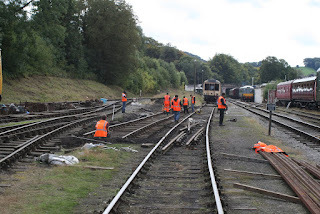 The DMU team worked away down the yard whilst the EVRA team did some maintenance on their coaches. Some work was carried out on fitting a new floor to one of the wagons to aid transport of materials around the railway. This is just in the planning stage at the moment with work due to commence after the mammoth picnic bench refurbishment project. Much planning for next year took place already as enquiries for next year have begun already. Much more steady than yesterday on the train where Rob stood in on the first two returns to cover the third man position. There's still plenty of spaces this weekend! The buffet had a surprise walking party munching their way through the tea cakes. The PW team were out in force today and they managed to exchange the poor quality rails which have been in Platform 1 since the year X with new secondhands. The operation was swift and almost seemed effortless. The photographs show the old rails flipped out and the perks the team got from working so close to the Catering Department! the Group said he had never seen a steam engine with so many parts !! What a difference a day makes! This morning the sun is shining but the scene shown above was the welcome for our hardy visitors yesterday. Also, a few days ago the Permanent Way "Bubble Car" was visible showing the steady progress being made with this long term project.